about the best choice for UC. 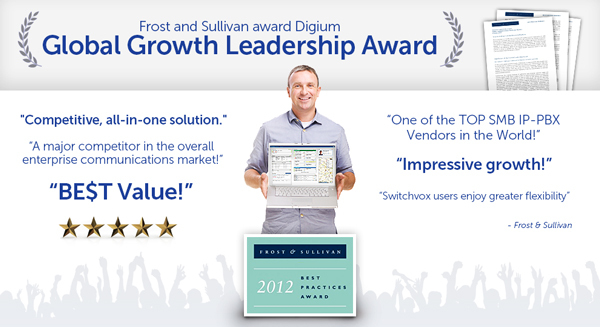 What makes Digium Switchvox better for your business? It is based on Asterisk, the world’s most popular open source communications platform. That means Digium Switchvox is designed to provide all the advanced UC features your business wants, but at a fraction of the cost of proprietary VoIP systems. And unlike other UC solutions on the market today, there are no costly add-ons with Switchvox. All features are included – even Switchvox Mobile. This free app for iPhone, Android and Blackberry makes it easy to communicate anywhere. Rounding out this complete solution are Digium’s IP Phones, which provide the tightest integration possible for your Digium Switchvox solution. Switchvox appliances come in multiple sizes so that you can have a powerful, VoIP phone system to meet the needs of your company today. And, you can easily future-proof your business for tomorrow too. As your business grows, with Switchvox Anywhere, you can seamlessly move to a larger system or the cloud with minimal associated costs and network changes. Compare Switchvox appliances and see which one is right for your business. Business phone system ideal for small businesses that need a shelf or desktop solution and a full-featured, server-class PBX. Business phone system ideal for mid-sized businesses with shelf space or a computer rack, that want the power of a server-class PBX. Business phone system ideal for large businesses that need a shelf or desktop solution and a full-featured, server-class PBX. If you have more users but are within the Max Concurrent Activities, please Contact Us to determine which size hardware you need. All appliances can be purchased without software as a Cold spare for failover or upgrade purposes. All appliances come with a standard 1-year hardware warranty. All Switchvox VoIP phone systems require a room temperature of 50˚C or lower. Exceeding Digium’s advertised number of maximum concurrent activities or conducting other concurrent activities not listed in this advertisement can significantly adversely impact call quality.